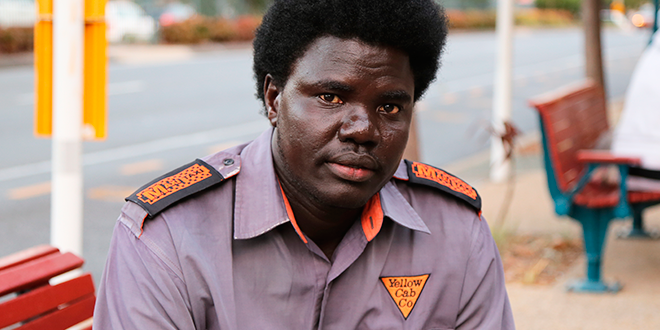 BRISBANE Catholic taxi driver Aguek Nyok has thought a lot about friends, family and faith in the 10 months since he kicked in the door of a burning bus to save the lives of 11 people trapped inside. At the bus stop in Moorooka – the location of his heroic action – he reflected on the intensity of the fire that day, and how it claimed the life of his friend, bus driver Manmeet Alisher, after a man allegedly set him alight. “It still sometimes brings me trauma,” Mr Nyok, a father of four and a former refugee from Sudan, said. Last October, Mr Nyok told The Catholic Leader he had stopped for a haircut, and ran to help after seeing a bus on fire. The front of the bus was filled with smoke. Passengers ran to the back door, but it was jammed shut. “People were screaming ‘open the door; please, open the door’,” Mr Nyok said. Tall and powerful, Mr Nyok used his karate skills – three front kicks and the door caved in, freeing the passengers. During the last ten months, Mr Nyok, 31, has travelled a unique journey trying to make sense of the horrific ordeal. In that time he has also embarked on a parallel journey piecing together fragments of his own life, ripped apart as a child in war-torn Sudan. After the bus attack last October, Mr Nyok was hailed as a selfless hero. Mr Nyok went back to work the day after the attack, driving his taxi ten hours a day to support his family. “I’m fighting it and I don’t want it to take any place inside me,” he said at the time. Mr Nyok said he prayed every night, and tried to swing his shifts so he could join his family for the Sudanese Mass at Mary Immaculate Church, Annerley celebrated in English and Arabic. He attended the baptisms of his two youngest children, trying to keep life “normal”. However, he was reluctantly caught in a media spotlight, and his swift and courageous action prompted Queensland Premier Annastacia Palaszczuk to recommend him for a national bravery award. 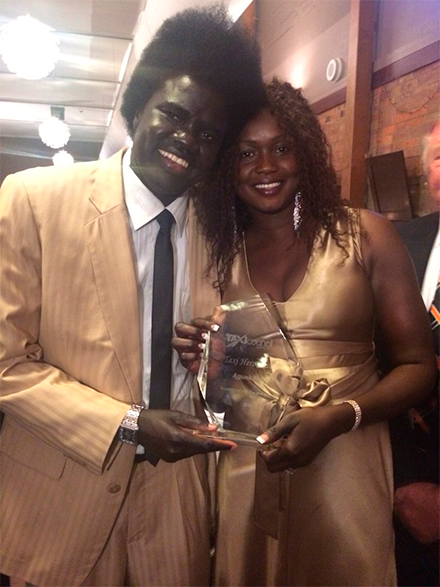 Heroic actions: Aguek Nyok and wife Monica at Taxi Awards night. Photo: Supplied. The Queensland Taxi Council presented him with a Taxi Hero Award. Passengers across Brisbane still recognise Mr Nyok, demanding to take “selfies” with him, and remind him of his “hero cabbie” status. Each reminder makes him shudder and shake his head. Behind Mr Nyok’s public smile, perhaps only his wife, Monica, knows the full impact. For years Manmeet Alisher had been Mr Nyok’s friend. 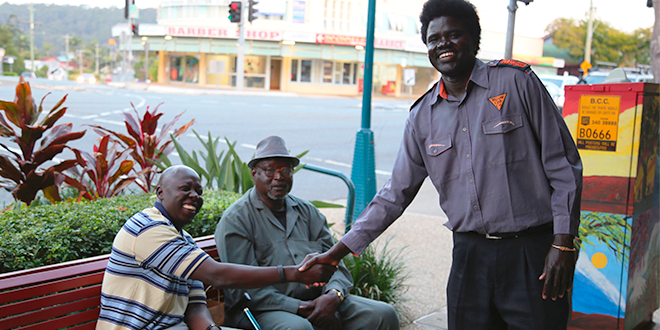 They were taxi drivers together, sharing stories as they waited at taxi ranks across Brisbane. Mr Alisher, a singer, actor and a well-liked member of Brisbane’s Indian community, shifted to bus driving only three months before the horrific attack, as he attempted to work more regular, family-friendly hours. As the anniversary of the tragedy approaches, Mr Nyok said he planned to visit and console Mr Alisher’s sick and elderly mother, who lives in India’s Punjab state. No matter about the distance, or the expense, or even the inconvenience, Mr Nyok just wants to go. “Put Jesus in front of you,” he said. Aguek Nyok: “My hope is that I can sit with my children and say to them ‘Here, this is your grandma, this is your uncle’.” Photo: Mark Bowling. Soon after the bus attack, Mr Nyok made a momentus decision. For most of his life he had wanted to track down his extended family. Now he decided to make it a mission. In March, Mr Nyok embarked on a journey to Africa to reunite with his mother and to try to find his older brother, both of whom he has not seen since he was six. The last time he saw them was as he ran into the night amid gunfire when his village in Sudan was attacked during the country’s civil war. 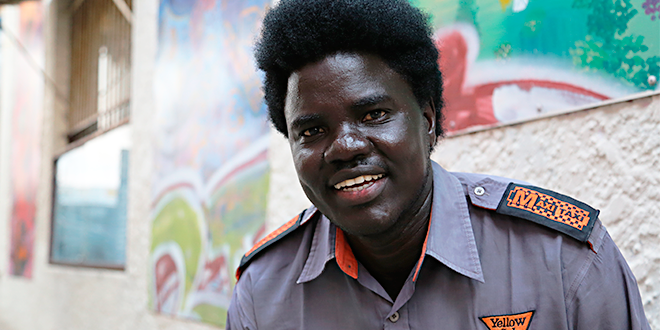 Mr Nyok fled to Khartoum, before travelling to Egypt where he stayed until coming to Australia in 2005. For nearly two decades, his once close-knit family has been scattered across continents, something Mr Nyok said he thought about every day. “Being by yourself, alone, is not an easy thing,” he said. “You want to find your family. “Unless it is confirmed they are dead you will try and find them. In 2010, Mr Nyok discovered his mother lived in Cairo, but he had only ever spoken to her by phone. He started supporting her by regularly sending money. “I had always wanted to go to her in Cairo, but here in Australia I have small kids to feed, so I didn’t go,” he said. Mr Nyok said the bus attack triggered him into action – especially after witnessing Mr Alisher’s brother arrive from India for Manmeet funeral and hearing from Mr Alishers’s mother “who just wanted to touch her son’s body after he had died”. Mr Nyok prayed every night about what he should do, before embarking on his own, personal mission. He flew to Cairo, and in a ramshackle apartment, felt the warm embrace of his mother, Mary, for the first time since he was a child. And for the first time he met his four younger brothers and three sisters. “All my life I had built up protection. Just in that moment it became like a new life for me,” Mr Nyok said of their first encounter. Despite the pressures of being a refugee living in Muslim-dominated Cairo, Mary Nyok, maintained her Catholic faith and raised all her children to go regularly to church. 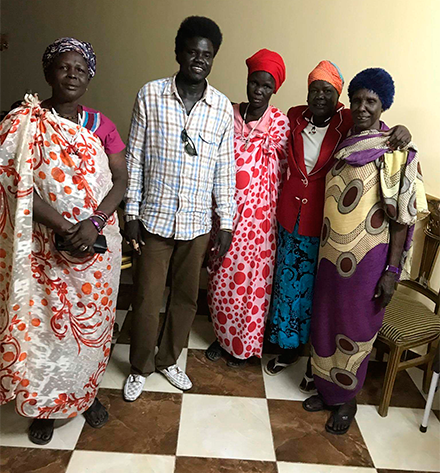 Family reunion: Aguek Nyok and his mother, Mary, (far right) with friends in Cairo. Photo: Supplied. After two weeks in Cairo, Mr Nyok travelled to Juba, South Sudan’s war-weary, hunger-stricken capital, determined to track down his older brother, Aguang. Mr Nyok met up with an uncle who had several leads about where his brother might be. He embarked on a difficult and dangerous road trip that took him to many places, including his home village of Abyei on the border between Sudan and South Sudan. Mr Nyok encountered the volatility of daily life in South Sudan – rifle-toting government soldiers and opposing militias battling on the streets, with “civilians stuck in the middle as victims”. He witnessed thousands of people taking refuge in the Catholic cathedral in Juba trying to escape violent clashes between rival factions of the army, respectively loyal to President Salva Kiir and former Vice President Riek Machar. “It’s a big mess. It’s really dangerous,” Mr Nyok said. Despite boasting sub-Saharan Africa’s third-biggest oil reserves, half of South Sudan’s 12 million people are fighting poverty and hunger, and millions have sought refuge in neighbouring countries. Mr Nyok saw the flood of refugees as he crossed secretly into (northern) Sudan. “They have got tents and that’s all that some of them have got. They don’t even have clothes or food to eat,” he said. Amid the turmoil, the Catholic Church is one of the biggest providers of humanitarian aid, with Catholic Relief Services alone providing assistance of some sort to more than one million South Sudanese, and working in partnership with local dioceses, parishes and religious congregations. Mr Nyok travelled by bus, stayed in modest hotels and tried not to draw attention to himself as a foreigner. 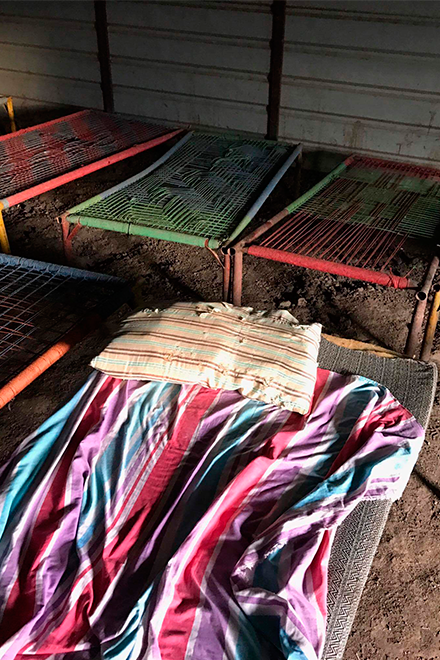 Difficult journey: Inside one of the “hotels” which Aguek Nyok stayed while searching for his brother. Photo: Supplied. “If they suspected I was an American, or an Australian I could be kidnapped and held for ransom,” Mr Nyok said. As he travelled, he spoke only Dinka, his mother tongue, and he said there were many times when he didn’t know whom to trust, to ask about his brother, or to protect himself. “When the call comes, you are going to go. That’s what I believe in,” Mr Nyok said of his harrowing experience. After three months travelling in danger, Mr Nyok, was unable to find his brother, but he still holds out hope of finding him. Now back in Brisbane, Mr Nyok said he was still trying to assemble the “missing parts” of his life – he will continue searching for his brother, and he hoped to bring his mother, and his younger siblings to Australia. He is working with an immigration lawyer to try and make that happen. “My hope is that I can sit with my children and say to them ‘Here, this is your grandma, this is your uncle’,” he said. Mr Nyok hopes to travel to India to be with Manmeet Alisher’s mother and family on the anniversary on the Moorooka bus attack on October 28.